While the showers fall into autumn air, a northeast wind will blow off the ocean to further cap temperatures in the 50s Saturday afternoon, with showers diminishing from North to South during the afternoon and evening. It was mainly light to moderate rain across central and southern New England early this morning - except from Salem to Lynn. A long thunderstorm popped up and drifted southwest. Rainfall rates reached 6 inches per hour in the heaviest part of the cell. Flood Advisories were upgraded to Aerial Flood Warnings to Flash Flood Warnings in northeastern Suffolk and southern Essex counties. With the freezing level around 10,000 feet, hail was also reported and a Severe Thunderstorm Warning was issued. There was one report of 1 inch hail (severe hail) in Lynn. By 6:30 a.m. we started to see the first reports of Flash Flooding. Nearly a quarter million people woke up to their phones vibrating or ringing when the EAS (Emergency Alert System) activated on their phone for the Flash Flood Warning. The heaviest rain moved out of Lynn to Winthrop to East Boston to Quincy. There were dozens of Flash Flood reports. Cars were stranded in flood water and some people needed rescue. Tonight once we clear out, we are expecting a front/freeze across central and northern New England. Temperatures will drop into the mid-30s. Sunday, the weather looks beautiful. We will see sunny skies, low humidity and temperatures in the upper 60s and low 70s. 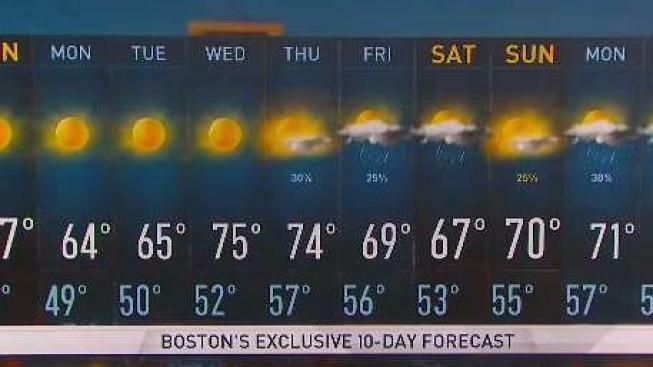 The weather will be perfect for the Red Sox final regular game of the season and the Patriots game against the Panthers.